Gordon Grice • Penguin, 2010, 383 pp. Nature, Grice asserts, is surprisingly scary, or surprisingly natural. We know that sharks, coyotes and wolves are dangerous — although much of our “knowledge” is myth compounded by hearsay. But if we are fascinated with predators — eyeballing lions is a rite of passage for those with the curiosity and coins for an African safari — why are we surprised when a predator does what comes naturally? Perhaps, Grice says, because we deem ourselves outside of nature, observers, not participants. But seeking nature may place us inside nature — as a threat or even a daily special on a predator’s menu. 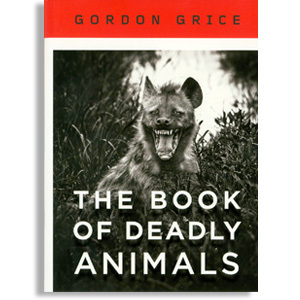 In the chapter on felines, Grice muses while watching his house cat toy with a mouse. Wild and domestic cats are masters of efficient hunting, and they practice capture techniques with doomed prey. Dumb or careless human behavior can precipitate an attack, Grice maintains. In Alaska, a sea lion bit a man on the buttocks. He had been feeding sea lions, and one witness even saw fish in his — yes — back pocket. In the long run, this book is a plea for realism… Carnivores eat meat, and humans carry a good deal of meat. Something was definitely wrong with the natural — and human — order toward the end of War II, when the U.S.S. Indianapolis was torpedoed and sharks devoured hundreds of stranded U.S. sailors. Sometimes, the author does try too hard, as when he stretches back to 1813 to find a person impaled (ouch!) by a swordfish. On the brighter side, the piranha, a South American fish that was once thought to gang up (school up?) and strip a person to the skeleton faster than you can spell-check “piranha,” turns out to be a mere nibbler. The pencil catfish proves that small is not always beautiful. If you urinate in the water, it may swim up your urethra — and wedge itself in that essential item of excretion. Your next urination will await a visit to the surgeon. And what is the real king of the beasts? Grice gives that honor to the orca — a dolphin relative that’s sometimes called a killer whale. Orcas — often in small groups — can prevail in a high-risk dining encounter with a great white shark, Grice says. Despite the fears of a Mexican fisherman I knew who gunned his engines at the first sight of orcas, Grice says they seldom prey on people. Why bother with a 150-pound hors d’oeuvre when you can feast on a two-ton entree?